YouTube’s live television streaming service, YouTube TV will now be available nationwide. On their official blog, YouTube announced that YouTube TV is expanding coverage of their service to 195 markets in the U.S., covering 98% of the country. With this news comes many opportunities for marketers to be able to get right in front of their target audience, at a much lower price point than traditional cable advertisements. But Wait, What is YouTube TV? For those unfamiliar, YouTube TV is essentially an alternative to traditional cable television that was launched two years ago in five markets - New York City, Los Angeles, Chicago, Philadelphia and San Francisco - before this week’s expansion. For just $40 a month (half the price of cable! 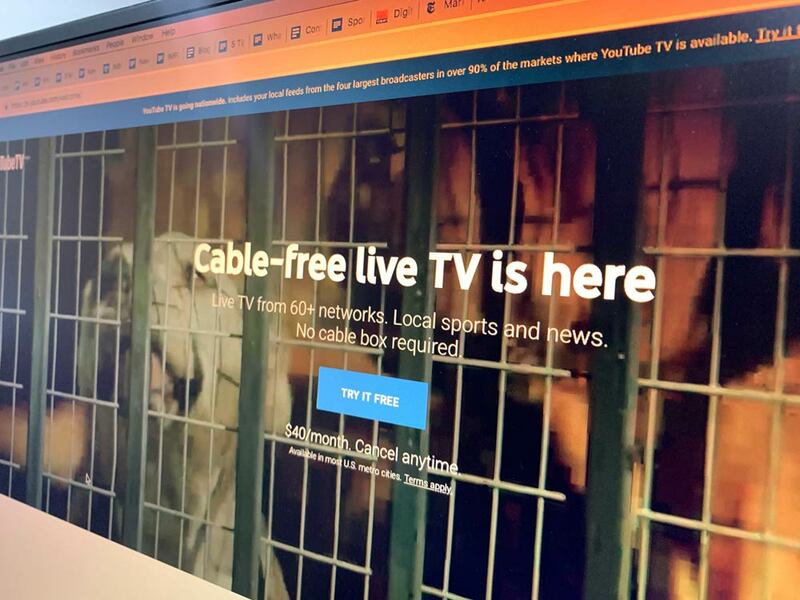 ), users can access major networks like ABC, CNN, FOX, NBC, CNN, TBS, ESPN, and more - while also being able to view local news in their area as well. These networks can be watched on live TV, on-demand, or recorded on a cloud-based DVR with no storage space limits. Users can also access YouTube TV on virtually any device - mobile, tablet, computer, or television sets. However, the biggest advantage over cable and other live TV streaming platforms is YouTube TV’s AI that provides the user with recommendations of things they’ll also like based on past activity. With a YouTube TV subscription, you also get six accounts, so you can share with family or friends without your recommendations being altered. Additionally, the service has zero commitments, so customers can cancel their subscription at any time, a common pain point when it comes to working with cable companies. With all of these incentives, it seems like a no-brainer for the consumer to choose over traditional cable. Honestly, in the process of writing this article, I actually subscribed to the platform myself! While this is a great deal for the consumer, it also presents several advantages for marketers to get in front of their target audience at a fraction of the cost a traditional cable ad and better analysis to show for it. With any live television, there is going to be ads and YouTube TV is no different. YouTube confirmed users can’t skip ads while watching live TV or with on-demand options,however, if they record a show on their DVR, then they’ll be able to fast forward through ads - which isn’t any different from cable. What is likely to be different is the user base. Many households are cutting the cord on cable, but YouTube TV has been successful in picking some of that base back up - they reported 800,000 paying subscribers in July of 2018. With the service being expanded across the United States, we can only expect this number to grow. This is a great opportunity for digital marketers and advertisers to reach these people they may have lost (or not afforded to reach) via cable. With traditional cable advertisements, you’re paying for a time slot, meaning everyone viewing that channel will see the same ads. YouTube TV’s ad content is smart. It leverages a user’s profile to determine what ad they’re likely to be interested in based on other activity and because YouTube is a Google-owned company, you have access to even more advanced targeting capabilities. Targeting beyond network and time slot, means better ROI. Additionally, when you create a video advertisement for YouTube TV, it can also appear on standard YouTube videos that are viewed on a TV screen. It’s no secret that the platform is home to billions of videos and with the rise of smart TVs, YouTube says that watch time of its content on TV sets has doubled year-over-year. This trend is great news for marketers. Why? Well, despite traditional cable is fading, that doesn’t mean that television ads aren’t effective. With desktop or mobile ads, it’s easy to distract yourself and tune out most ads. With television, ads do a significantly better job of capturing your attention. In fact, a study by Ipsos Lab Experiments found that YouTube ads shown on TV screens resulted in an 47% increase in brand recall and 35% increase in purchase intent when compared to other platforms. With cable viewership on the decline and the lack of data, it’s tough to justify the high cost for smaller brands. YouTube TV advertising, on the other hand, comes at a much lower price point. YouTube TV uses the same bidding technique that Google search ads are based on, so you pay for the number of views. While just one spot on a cable ad can be thousands of dollars, WordStream reported that YouTube TV ads can be as low as $0.03 per view. Without analytics, it’s impossible to tell if any advertisement is worth the cost. To make sure marketers can make educated decisions on their campaigns, Google ads has specific, television-focused analytics for ads running on TV screens. This way, if you’re running a campaign on several different display options, you can see how it’s performing on mobile vs. desktop vs. television, so you can determine what your users are most receptive to. Additionally, you can also better connect a customer seeing your television ad, and going to your website to make a purchase, thanks to access to Google’s enhanced tracking features. Overall, YouTube TV going nationwide may change commercial advertising as we know it forever (and for the better). Not only will it be more data-backed and targeted, but it will make advertising via commercials far more attainable for smaller brands with limited budgets.